The W6206018 is Cartier's Roadster series model. Its band combines black rubber with stainless steel accents to add an athletic edge to your fashionable looks. This Cartier watch features a scratch-resistant sapphire crystal ensure lasting quality for this classical beauty. The all stainless steel case and black rubber bracelet are complemented by a silvertone opaline dial with black Roman numerals and a date window at the 3 o'clock position. The watch features a precise, Swiss-automatic (self-winding) movement. This beautiful piece is water resistance up to 330 feet. This Cartier Roadster's original price is $4,550. 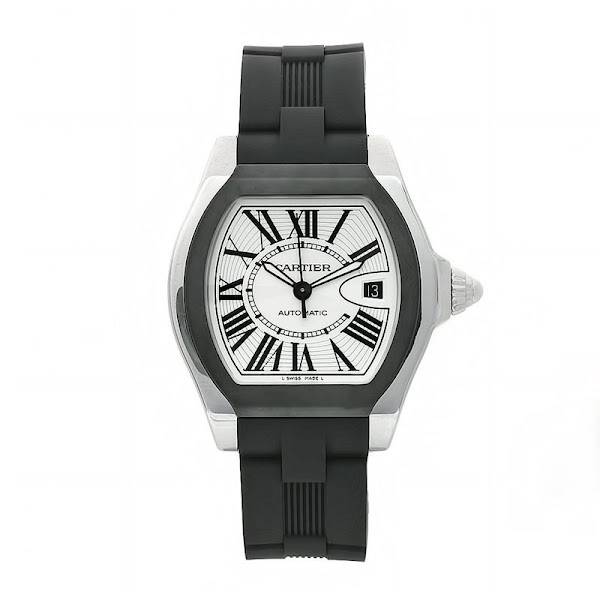 You can find an original Cartier W6206018 Watch at the site(s) listed above. However, we don’t guarantee its availability as being listed here simply means that those site(s) has the item in question by the time we wrote the review.